The CLEP College Algebra examination and this interactive clep math practice computer software cover material that is usually taught in a one-semester college course in college algebra. Nearly half of the CLEP tests consist of routine problems requiring basic algebraic skills; the remainder involves solving nonroutine problems in which candidates must demonstrate their understanding of concepts. The subject matter of the College Algebra CLEP exam and the contents of this learning software are drawn from the following topics. The percentages next to the main topics indicate the approximate percentages of exam questions on those college algebra CLEP exam preparation topics. Use this College Algebra CLEP software as a review and test prep to learn and practice college algebra or for the college math placement exam. 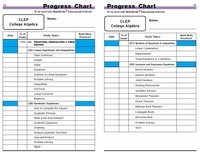 This CLEP software provides algebra 2 help and college algebra help with samples, practice, and tests. Algebra problems are practiced with hints and solutions. Conclude your CLEP test prep with a sample CLEP exam which is scored with weaknesses indicated for further study in the CLEP software. Take the practice college algebra CLEP exam before you begin the learning and practice sections and/or take the practice algebra CLEP test after you complete the learning and practice sections. The flexibility is there for you to use to your best advantage. Students are taking math CLEP exams to gain credit for college algebra courses. 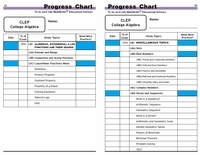 These CLEP tests provide students who have limited time and/or funds with the opportunity to complete their college math requirements at their own speed and schedule. This college algebra help software speeds up the learning process so that students walk into the college algebra CLEP exams with the confidence that comes with proper preparation. Whether you are preparing for the college math CLEP test or practicing for an Algebra 2 placement test or a college math placement test, you will find the topics in this comprehensive program instructive and relevant. Typically, how long does it take to complete this particular program? Will this program prepare me for the college algebra clep test? Yes, if you complete this program and you understand the material you will pass the CLEP exam. Along with the practice CLEP test, there are over 90 learning sections - these learning sections will take between 30-60 minutes to complete. If you dedicate the time and discipline to follow this learning system to learn college algebra, you will be successful.